Kay took over the reins of state government and her appearance as a seasoned veteran of state politics seems to resonate with voters. Polling indicates that the governor’s race is hers to lose. Therefore, the less she does may be the best course. Her support is a mile wide and an inch deep. A slip and fall could derail her train. Tommy Battle, the popular Mayor of Huntsville is poised to make a formidable run at Kay in the closing weeks. He has some money in the bank and will come out of the vote rich Tennessee Valley with a good friends and neighbors vote. The Evangelical Roy Moore voters appear to be coalescing around Evangelist Scott Dawson. My guess is that Walt Maddox, the young 45-year old Mayor of Tuscaloosa is benefitting from a grass roots support among African American voters in the Democratic primary. If indeed this is the case, Maddox will be favored to capture the Democratic nomination. Will Barfoot has emerged as the frontrunner in the closely watched open Montgomery/River Region Republican seat. Incumbent State Senator Paul Bussman is in a close contest with Cullman City Council President Garlan Grudger. Polling indicates that this one may be too close to call. Bussman’s departure from the GOP Senate Caucus has given his constituents the perception that he may be rendered ineffective. This district is politically savvy. Veteran educator, Wayne Reynolds, may be poised to win the State Board of Education District 8 seat in the Huntsville-Tennessee Valley area being vacated by Mary Scott Hunter. Mary Scott and Sam Givhan are battling for an open state Senate seat in Huntsville. This race is one of the best Senate races in the state. Both Givhan and Hunter are heirs to great Alabama legacies. Givhan’s grandfather was legendary Black Belt State Senator Walter Givhan. Ms. Hunter’s daddy, Scott Hunter, is one of Bear Bryant’s famous quarterbacks. 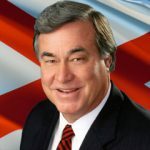 Speaking of legends, Alabama political icon, Milton McGregor, was laid to rest a few weeks ago. He would have been 79 today. Montgomery’s Frazer Memorial Methodist Church was overflowing. A good many of the state’s past and present political powers were there, including several past governors and a sitting U.S. Senator. One of the state’s most famous and personable preachers, John Ed Mathison, presented a masterful sermon. He is a great man. He and his wife were best friends with Milton and Pat. It was actually a joyous political homecoming event. As folks were visiting and reminiscing, one of Alabama’s most prominent pulmonary physicians, Dr. David Thrasher, who has been a doctor to many famous Alabamians and was one of Milton’s pallbearers was visiting with me and said, “Steve, I was at Governor Wallace’s funeral when Franklin Graham spoke and it doesn’t compare to this.” Then he quipped, “Steve, I got a call from Billy Graham. He said that he had met a nice guy at breakfast by the name of Milton McGregor. Milton said to tell John Ed to remind the people down here that if they did good and believed in Jesus that they could be a winner too and join him.” That’s what John Ed said.